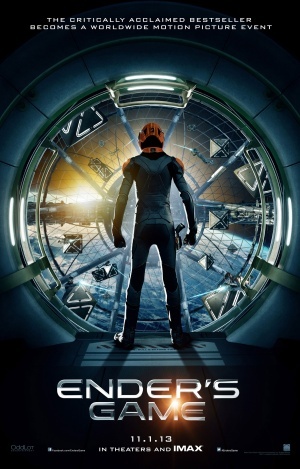 A new (and supposedly final) trailer for the sci-fi actioner Ender’s Game is now available for viewing. Within, fans of the bestselling novel will find an improved array of dizzying visuals to support the tale of the life and death struggle of the human race. Asa Butterfield appears more stoic in this trailer as well — an attribute necessary as the character he plays, Ender Wiggin, is expected to save humanity from an alien invasion. Harrison Ford as a grizzled Colonel responsible for training Ender gets in a few powerful lines too. Check out the embedded trailer and get ready for the assault. Ender’s Game stars Asa Butterfield, Hailee Steinfeld, Abigail Breslin, Harrison Ford, Ben Kingsley, Viola Davis and Moises Arias. 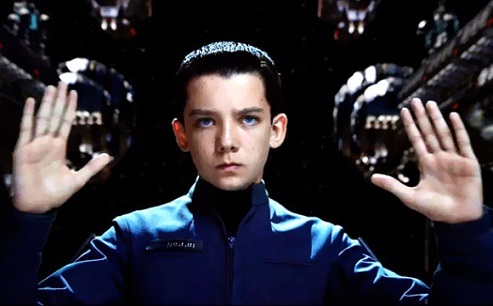 Ender’s Game saves from marauding aliens US theaters on November 1, 2013 and UK theaters on October 25, 2013. Hold your breath if you think they’ll remain faithful to the book. Does look good. Probably won’t see it though. Fingers crossed: Please be good. Please be good. Please be good. Harrison Ford in every new role he tackles is a grizzled miserable SOB. They’ll screw it up for sure. Looks like they’re scaling back the battle room sequences and focusing in on the actual battles. I hope I’m wrong. It’s a big step up for Asa Butterfield. Backlash will be cruel if he doesn’t get it right. He’ll do fine. I’m more concerned with Sir Ben and Harrison Ford only hitting a single note. Looks like every other science-fiction movie that’s come out in the past five years to me. I’ll hold off until it reaches the cable channels. So the future of military campaigns WILL be as easy as playing a game of StarCraft!